ONE Championship returns to Bangkok, Thailand with a host of local martial arts heroes, rising stars and a World Title contest to crown the best bantamweight Muay Thai athlete on the planet. These contests at ONE: CLASH OF LEGENDS are sure to showcase Thailand’s national martial art in all its glory, and thrill fans around the world. Ahead of this showcase in the spiritual home of Muay Thai, check out the key plotlines to follow at the Impact Arena on 16 February. Two of the best bantamweight Muay Thai athletes in the world will go head-to-head in the night’s headline contest for the ONE Bantamweight Muay Thai World Championship as Thailand’s Nong-O Gaiyanghadao takes on Chinese star Han Zi Hao. Han has blazed a trail to a shot at the belt since his arrival in ONE Super Series with a series of spectacular performances. The Top King Muay Thai World Champion now has his eyes set on the biggest prize in Muay Thai – the World Title in The Home Of Martial Arts. The opponent standing in his way is a formidable one. Nong-O is a four-time Lumpinee Stadium Muay Thai World Champion with a staggering 312 bouts to his name, including 257 wins. The 32-year-old has lived up to his legendary status in his ONE appearances so far, and his clash with Han is one that has the Muay Thai world excited. They will do battle in the main event in four-ounce gloves in what promises to be a spectacular match. Shuya Kamikubo looks to pick up another stunning win for Japan on 16 February! An all-Asian battle of bantamweights sees South Korea’s “Ottogi” Dae Hwan Kim take on Japan’s Shuya “Stealth” Kamikubo in a pivotal clash for the division. Kim has proved his worth many times over in the ONE bantamweight class and has faced a who’s who of the top talent. Now he faces DEEP Tournament Champion Kamikubo, who arrived in ONE and surged up the rankings with back-to-back victories in 2018. Now, these two gritty competitors will go toe-to-toe knowing that victory will move them one big step closer to their ultimate goal – a shot at the ONE Bantamweight World Title currently held by Kevin “The Silencer” Belingon. 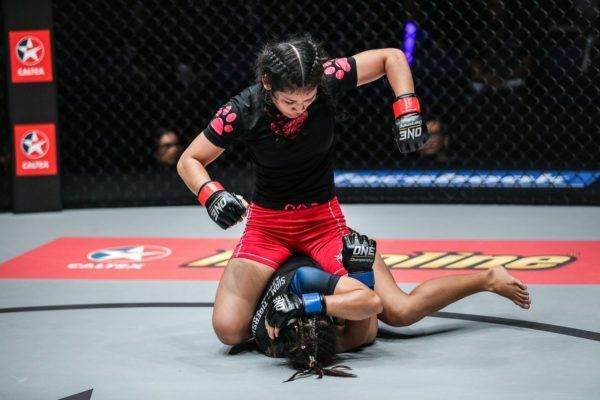 The women’s atomweight class will also move forward with a likely title contender likely to emerge from the clash between Filipina Gina “Conviction” Iniong and rising Malaysian star Jihin “Shadow Cat” Radzuan. Iniong has been an integral part of the Team Lakay group that has elevated Filipino martial arts to new heights and wants to be the latest member of the team to capture a ONE World Championship. To do that, she will have to stake a compelling case against Radzuan, who is undefeated in her young career and looking to keep that momentum going as she climbs the women’s atomweight ladder. Both women have decorated wushu backgrounds, but have also shown their proficiency on the mat. Their match-up could deliver one of the most exciting, back-and-forth contests of the night. Also, on the prelims, Thai hero Rika “Tiny Doll” Ishige will face Cambodia’s Nou Srey Pov. Both women will aim to make their voices heard in the weight class with a win. This week's episode spotlights OWS contract winner Mark Abelardo, who competes at ONE: CLASH OF LEGENDS! Rich Franklin’s ONE Warrior Series began last year in a bid to identify stars of the future, and one athlete who fits that bill is bantamweight Mark “Tyson” Fairtex Abelardo. Now, having graduated to the main roster after he impressed in ONE’s development league, his next test is to see if he can mix it with the best athletes in the world on the biggest stage in martial arts. He has been handed a stern test of his credentials as he takes on undefeated Shooto Featherweight World Champion Daichi Takenaka. It should be a fascinating clash as a rising star aims to prove his worth, against a battle-tested veteran with top-flight experience. Will knockout artist Samy Sana cool down Smokin' Jo Nattawut in Bangkok? Matchmakers were always going to pack the card with exciting ONE Super Series Muay Thai matches in Bangkok, and the card for 16 February is stacked with no less than five spectacular striking contests featuring World Champions. In addition to the main event bout, ONE: CLASH OF LEGENDS also features the debut of Kongsak “Left Savage” P.K. Saenchaimuaythaigym, who takes on crowd-pleasing Russian Alaverdi “Babyface Killer” Ramazanov, while the always-exciting “Smokin” Jo Nattawut looks to continue his rise toward title contention when he faces French striking sensation Samy “AK47” Sana. Another ONE Super Series debutant, Thailand’s Superlek Kiatmoo9, will kick off the main card against Cambodia’s Kun Khmer star Lao Chetra, and the United Kingdom’s Charlie “Boy” Peters will face off against the dangerous Chamuaktong Fightermuaythai in a 67.5-kilogram catch weight contest. All five bouts have the potential to produce thrilling action, and the Bangkok crowd are sure to be inspired by the action throughout the card. Home > Features > What’s At Stake For The Heroes At ONE: CLASH OF LEGENDS?